As Mark Goodacre mentioned on NT Gateway, the radio interview in which Stephen Carlson talks about Secret Mark can be downloaded here. Paul the Deceiver: A Sketch of the Apostle’s "True Rhetoric"
In Paul’s True Rhetoric: Ambiguity, Cunning, and Deception in Greece and Rome, Mark Given argues that the apostle was deceptively sophistic, saying things he really didn’t mean, insulting people “politely”, making rules and breaking them, patronizing the Jewish people, and masquerading like a chameleon according to the company he was in. This is an important work, if at times one-sided, offering new ways to understand the various tensions and contradictions in Paul’s letters. It also forces interesting questions about the nature of one’s “gospel truth”. Given examines Paul’s rhetoric in three places, cleverly calling his chapters, “Ambiguity in Athens”, “Cunning in Corinth”, and “Deception in Rome”. I’ll briefly sketch his findings. Given calls Acts 17:16-34 “the most sophisticated speech composed by the most accomplished narrator and speech writer in the New Testament” (p 68), for Luke presents Paul as using double-entendres left and right when addressing the Athenians. Paul continually insults the crowd but in a way that can be construed as either positive (or at least neutral) for purposes of saving face. He tells the Athenians that they are “in every way daimon-fearing” (17:22), which can mean that they are either “thoroughly religious” or “thoroughly superstitious” (p 69). Paul may be saying the former, in effect, while obviously meaning the latter since (in Luke’s eyes) the Athenians are idolaters. Paul then calls attention to the fact they “worship a god as unknown” (17:23), which can mean that they either “worship unknowingly” or “worship improperly/shamefully” (p 71), again perhaps saying the former but really meaning the latter. When he says that “God has overlooked their ignorance” (17:30), the Greek word for “overlook” can also mean “despise”. Paul may be saying, face-value, that God has overlooked their misconception, while really meaning that God has despised their errors for which they will pay (p 73). Given persuasively argues that the Areopagus speech shows Paul insulting his pagan audience, but ambiguously enough so that he can get away with saying what he really thinks. How genteel. I have serious doubts, however, about how historical this is. Luke has the tendency to tone down (or make ambiguous) insults in general. We see this by comparing his gospel to the two he used. Jesus’ rivals are “malicious hypocrites” in Mt 22:18/Mk 12:15, but they are “crafty” in Lk 20:23, a more ambiguous term. The Jesus of Mark and Matthew tells the Sadducees, point blank, that they are wrong (Mk 12:18-27/Mt 22:23-33), but the Jesus of Luke is more circumspect (Lk 20:27-40). Luke tones (way) down Matthew’s catalog of insults (Mt 23:1-36) against the Pharisees (assuming, as I do, that Luke knew Matthew); vicious insults like “brood of vipers” (Mt 23:33) are censored in Lk 20:45-47. Given declares that “although Luke’s portrait of a sophistic Paul may be fanciful, it is not necessarily fantastic” (p 82), based on what he then proceeds to demonstrate from the letters themselves. But the deceptions we are about to see in Corinth and Rome don’t involve the rhetoric of insulting — about which Paul was usually anything but ambiguous. The sophist Paul of Acts 17, while fascinating, is probably more a product of Luke than Given wants him to be. Turning to I Corinthians, Given finds Paul to be cunning in two particular places, I Cor 1-4 and 9:19-23. In the former, he tells his addressees that the only wisdom that matters is God’s wisdom rather than human wisdom (I Cor 1:18-25), only then to present himself as the conduit of true spiritual wisdom which they can’t hope to attain without him (I Cor 2:6-3:4). Given suggests that Paul is claiming to have a “secret and hidden wisdom of God” (I Cor 2:7) available only to the privileged — which would make him as bad as the gnostics he just finished bashing (in I Cor 1:18-25). Paul thus makes the rules and breaks them (see pp 95-103). Paul’s more infamous deception is the one he candidly admits to: that he “becomes like a Jew in order to win Jews” to the gospel (I Cor 19:20) and “becomes like the lawless in order to win the lawless” (I Cor 19:21). Despite scholarly attempts to avoid the obvious implications (or treat as hyperbole), the apostle is admitting that he temporarily, and cunningly, practices Torah in order to win Jews, and then behaves like an immoral pagan in order to win Gentiles. Paul’s real view, of course, squares with neither behavior, for he insists that while the Torah is obsolete, the best of its requirements are fulfilled on the avenue of the spirit. It’s as if a Southern Baptist were to try converting a group of Jews by observing Torah in their presence, and then later mix with heathens by drinking, dancing, and smoking pot. This is an interesting way of looking at it, but I wonder if Paul really thought about justifying his deceptions this way. Is Given perhaps trying too hard to find a rationale here? The idea that people need to be deceived for their own good is fairly common, and one we practice all the time, if without realizing it. Paul’s masquerades may simply reflect normal human behavior more than anything. If Paul was ambiguously insulting in Athens, cunningly self-serving in Corinth, he was deceptively patronizing in Romans. Scholars have tried accounting for Romans’ more positive estimation of the Torah and Israel in various ways: Sanders thinks Paul changed his mind over time — that after struggling through certain theological dilemmas, he came to a more positive view of God’s purpose in giving the law and Israel’s salvation (Paul, the Law, and the Jewish People). Tobin thinks Paul revised his arguments for more expeditious reasons — out of concern for a bad reputation (Paul’s Rhetoric in its Contexts). Esler thinks the situation in Rome provides the answer — that Paul was trying to resolve ethnic conflict in the Roman church, and the success of his strategy depended on acknowledging the value of each group’s ethnicity; i.e. there had to be something good about being Jewish (Conflict and Identity in Romans). In contrast to these approaches (though in a way similar to Tobin’s), Given thinks Paul’s views didn’t change one bit since Galatia and Corinth. He “hasn’t really softened his view of the law at all” (p 157), only his scandalous rhetoric. His true position on the law and the Jewish people remained exactly the same. The law may be holy (Rom 7:12), and God may have given it for the best of reasons (for “life” in Rom 7:10), but it’s still entirely useless and unable to do the job God gave it; the best it had to offer can be fulfilled only by a radically different route (the spirit) (Rom 8:1-4). The only difference between Galatians and Romans in terms of the law’s purpose is that in one the law (and thus God) is an active agent in confining Israel under the power of sin (Gal 3:19-26), while in the other sin itself is the agent (Rom 7:7-25) — thus absolving God of the blame. But “subtract the sin scapegoat in Rom 7, and what remains?” asks Given (p 157). Exactly the same as before: an ineffective and completely useless law, unable to save people. Likewise, even though Paul now credits the Jewish people with having “adoption”, “the covenant/law”, “worship”, “the promises”, and “the patriarchs” (Rom 9:4-5), that’s empty credit, because we know what he really thinks: that real adoption comes from being liberated from the law (Gal 4:5) and being led by the spirit (Rom 8:14-15); that there are two covenants, an old and a new, the former of which has been superseded by the latter (II Cor 3:6-14); that real worship takes place “in Christ” (the temple of one’s body) rather than the Jerusalem temple (I Cor 3:16-17); that the real heirs to God’s promises are Jews and Gentiles in Christ rather than Israel under the law (Gal 3:19,22,29; Rom 4:13-14; Rom 9:6-24); that the only patriarch who means anything is a revisionist Abraham, the father of those who have faith regardless of their ethnicity (Gal 3:6-9; Rom 4:1-17), and the root of a tree from which natural branches (Jews) broke off in order to make room for unnatural branches (Gentiles) (Rom 11:17-24). What Paul really thinks, says Given, isn’t hard to figure out (see pp 159-168). Paul admittedly comes across as deceptive in Romans, but I’m also confident that he’s changed his mind about a few things. It’s difficult to ascribe the passionate arguments of Rom 7:7-25 and 11:1-36 to pure deception. Paul was human enough to deceive, but he was also human enough to care. And Sanders is right: Rom 7 & 11 show a deep concern about God’s perversity and inconsistency. Perhaps the best way of putting it is that Paul wants to have it both ways. He wants to improve his theology without admitting that he’s doing so, or that he was ever wrong. In that sense he’s indeed a deceiver, and more than likely, a self-deceiver. Given is most persuasive about Corinth. That’s where Paul is aggressively deceptive, in more ways than one. I like his treatment of Romans too, though would insist that at least some of Paul’s opinions about the law and Israel have truly changed. With regards to his speech before the Athenians, the ambiguously-insulting rhetoric probably owes more to Luke than Paul, who had less tact. I don’t want my criticisms of Paul’s True Rhetoric to suggest an ambiguous enthusiasm on my part for the book. That would be deceptive indeed. This is a fantastic book for asking all the right questions, and trying to understand Paul in terms that western people are inclined to distrust. I hope to see more work that builds on Given’s approach. According to the article Chris cites, however, Mirecki’s comment may have been taken out of context — addressed as it was to a closed listserve — and seems to have been directed toward the religious right’s particular agenda regarding the teaching of ID/creationism as if it were science. I seriously doubt Mirecki is out to “destroy anyone’s faith” in general. But, as I mentioned on Chris’ blog (in comments), this is like saying that one has religious reasons for rejecting the idea that the sun revolves around the earth. One may just as easily have religious reasons for accepting such an idea — or indeed, as many do, ID. As I promised before, I will be shortly dealing with Mark Given’s ideas about Paul’s conniving deceptions. Rue’s observation is spot on. The western aversion to lying and deception is amazing when considered in proportion to how often everyone does it. Tyler Williams has hit on a solution to the question of identifying bibliobloggers, by designing a seal of approval for “white male bibliobloggers everywhere, but especially in developed nations”. (See all the links in Tyler’s post to observations from other bloggers.) I love it. Given his sense of humor, it wouldn’t surprise me if Tyler has read James Finn Garner’s Politically Correct Bedtime Stories, and Once Upon a More Enlightened Time. Some of these revisions of children’s stories had me laughing so hard that it hurt when I first read them. Little Red Riding Hood scolds the rescuing woodsman for daring to presume that women and wolves can’t solve their problems without a man’s help, and without resorting to violence. Sleeping Beauty is a “sleeping persun of better-than-average attractiveness”. Hansel and Gretel become persuaded by the old woman — a benevolent Wiccan — to discard stereotypes of witches and assert their bonds with Mother Earth. The Three Bears end up eating Goldilocks (an invading research-driven biologist), even though they are vegetarians, because “trying new things” is a benefit of being multicultural. On the serious side, I do hope to see more female bibliobloggers, but I don’t see much of it happening. I’ve already mentioned my reason here; I just don’t think women are as inclined to preach via the blog — that’s what we do, after all: “preach”, though academically, and regardless of how religious or secular we are — as men are. The biblioblog is a form of self-aggrandizement, and women don’t care to draw attention to their own importance as much (or in the same way) as men do. Which is certainly not to say that our blogs serve the sole purpose of self-aggrandizement (if I thought that I wouldn’t blog). We blog for very positive reasons too. James Finn Garner would no doubt have a perfect parody for the issue we’re debating. Hardly a week goes by when I’m not working on Romans, and lately I’ve been spending time with Thomas Tobin’s Paul’s Rhetoric in its Contexts: The Argument of Romans. One of Tobin’s noteworthy contributions is his outline of the letter, particularly in how he groups chapter 8 with what follows rather than what precedes. I don’t think anyone has suggested this before. Tobin is on good grounds with the structure, though perhaps not thematically, as the themes of chapter 8 go more with what precedes. So that’s food for thought. Here are five outlines of the letter (including Tobin’s) for comparison. I like Esler’s for theme, Tobin’s for structure. Joseph Fitzmyer, Romans, pp 96-101. Ulrich Wilckens, Romer, 1:ix-x; 2:vii-viii; 3:vii. Philip Esler, Conflict and Identity in Romans, passim. Thomas Tobin, Paul’s Rhetoric in its Contexts, pp 425-430. Almost 50 years after Morton Smith’s “discovery” of Secret Mark in 1958, Stephen Carlson has put the hoax to rest. His case against Smith is strong enough to be deemed conclusive, and can be summarized as follows. * The author of Secret Mark must have read James Hunter’s novel, The Mystery of Mar Saba, published in 1940. Philip Jenkins first made this connection in 2001, and I’m sure that if it had been made back in the 70s, a lot less people would have been duped. The novel is about a forgery at the Mar Saba library, exactly where Smith “discovered” Clement’s letter. Furthermore, as Carlson notes, both Secret Mark and the novel’s fictional discovery reinterpret a resurrection account from the gospels in naturalistic terms. * Smith published a paper — right before his discovery of Secret Mark — in which he connected both Clement of Alexandria and “the mystery of the kingdom of God” (in Mk 4:11) to sexual immorality (in T. Hagigah 2:1), which, of course, is exactly what Secret Mark is all about. Amazingly, no one ever picked up on this before Carlson. (1) M. Madiotes — the “bald swindler”. (2) Morton Salt — the company which invented the kind of salt presupposed in Clement’s letter. (3) Jesus’ gay affair — with the young man later seen in Gethsemane, where Jesus was arrested, thus evoking the cultural milieu of America in the 1950s, where police were cracking down on gay men who met in public parks and gardens. Identifying these signature-confessions constitutes the bulk of the book, and it’s brilliant detective work on Carlson’s part. When taken in conjunction with the rest of the damning evidence, forger’s tremors, and convenient “coincidences”, they suffocate Smith’s hoax once and for all. 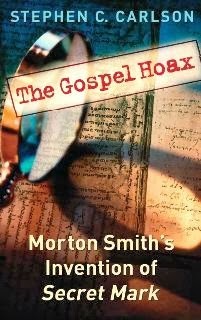 Carlson insists on distinguishing hoaxes from forgeries, and believes that associating Secret Mark with the latter has hindered a proper understanding of what Morton Smith was really up to. While I certainly think Secret Mark can be called a forgery, I appreciate Carlson’s concern about motive. He’s essentially right: Smith didn’t fabricate Secret Mark to support his academic theories; he wanted to test his colleagues with an elaborate prank. Secret Mark belongs in a category of hoaxes which include the Ern Malley Poems, Alan Sokol’s postmodern hoax, and the play by Sophocles really written by Dionysius the Renegade. In this sense, in terms of motive, it’s quite different from forgeries like Macpherson’s poetry, the Hitler Diaries, or Ireland’s Shakespeare play. I agreed with what Donald Akenson wrote in Saint Saul five years ago: it doesn’t take a specialist to spot the fakery in Secret Mark. But it did take an expert like Carlson — a legal expert, not surprisingly — to prove it. While Morton Smith is laughing from the grave, it would be a mistake to dismiss Brown as a fool. By all indications, he’s a sharp scholar who knows his stuff (though Mark’s gnosticizing of his own gospel is rather hard to take seriously). Even the best can be taken in by hoaxes, and that’s what happened here. In fact, I wasn’t sure how to rate this book. Does it deserve amazon’s lowest rating (one-star) for building a theory of gospel origins on a prank? Or is it valuable for precisely this reason, as an illustration of academic credulity in the context of a wider hoaxing phenomenon? Brown would find neither flattering, so I should point out some decent things about the book, especially in terms of what it argues against rather than what it argues for. Brown points out considerable problems with ideas that Secret Mark was part of an early version of Mark, part of a secret and elitist gospel, or was used for purposes of pre-baptismal catechism. He’s also right about certain scholars who have dismissed Secret Mark as a hoax for the wrong reasons — whether out of prejudice or malice. In particular, he scores zingers against Jacob Neusner, who clearly maligned Smith out of spite, owing to the infamous fallout between the two men. 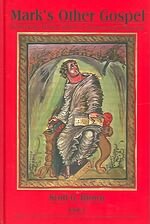 It’s embarrassing to see Neusner’s pre-’84 and post-’84 remarks laid out on the same page, as he went from Smith’s “brilliant account” of a discovery which “ranks with Qumran and Nag Hammadi, Masada and the Cairo Geniza, but required more learning and sheer erudition than all of these together”; to Smith’s “forgery of the century”! (see pp 39-40). Mark’s Other Gospel is ultimately the tragic product of a scholar who ignored (or couldn’t see) the humor in Secret Mark. That it’s the most ambitious treatment to date only accentuates the tragedy. Perhaps this serves all the more as a lesson to us, in the wider context of literary hoaxes and forgeries.